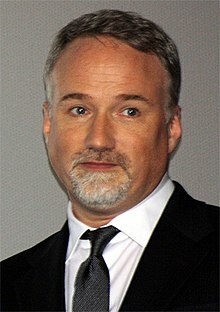 David Andrew Leo Fincher (born August 28, 1962) is an American movie director. Fincher was born in Denver, Colorado. When he was two, he moved to San Anselmo, California. When he was in his teens, he moved to Ashland, Oregon. He directed Alien 3, Seven, The Game, Fight Club, Panic Room, Zodiac, The Curious Case of Benjamin Button, The Social Network , The Girl with the Dragon Tattoo and Gone Girl. He won a Golden Globe Award and a BAFTA Award for directing The Social Network. He also directed the first 2 episodes for the TV show "house of cards"
He has also directed music videos, including Love Is Strong by The Rolling Stones, which won a Grammy Award. This page was last changed on 3 December 2015, at 04:58.